November 2011 note to HousingStory.net readers: This is an old post from January 2009. The site which carried it is being shut down. Bankruptcy invalidates debt which cannot be paid. At present, we may have $5 trillion of mortgage debt which needs de-validation because it is un-payable. It’s a big job. If true, then the United States Treasury must issue a check to cover the bill. Thus will our un-payable mortgage debt go away. We will live happily ever after. To work hard. To pay off this huge new debt. And pledge against borrowing recklessly to purchase homes. The primary beneficiary of this plan, in addition to individual homeowners, is our bankrupt banks. They are now incapacitated, and our economy cannot thrive without their lending. They will live again after their $5 trillion dollar death sentence is commuted. Present leadership need not be retained. My suggestion is tar & feathers for them. Plan Orange in Summary: The Graphic End of the Financial Crisis (Caption notes to explain the chart above). Plan Orange pays down the mortgage debt of all property owners in the United States to 80% of the value of their home today. The purpose is twofold. The plan pays down mortgage debt to make it more affordable and to bring it current. It also strengthens all banks who own mortgages. The bill for Plan Orange may be as high as $5 trillion. This graph attempts to estimate the amount of negative equity nationwide in the United States by the end of the year. Negative equity measures the amount by which a mortgage balance exceeds a property’s value. The graph exaggerates the problem, but may make it easier to understand. The graph on the right side depicts the total of all mortgage balances on residential properties in June 2006 and at the end of this year (12/09). The graph on the left side depicts property values in June 2006 and then a 40% loss by the end of this year. Determining the total amount of negative equity helps define the amount of mortgage loans which will not be repaid. 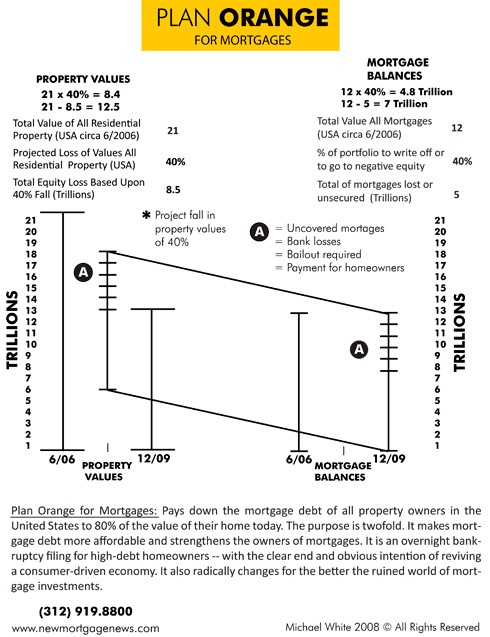 The value described as (A) is both the estimate of negative equity in December 2009 and the estimate of payments under Plan Orange to reduce mortgage balances. So let’s issue a check from Treasury to individual homeowners to erase all uncollectible mortgage debt; or actually issue a check payable to the mortgage creditor for the benefit of the mortgage debtor. It’s a rapid-fire bankruptcy. It’s an instant recapitalization of banks. It’s a sharp turn of our economic ship away from the massive icebergs which our Titanic property market now advances toward full steam ahead. It’s a bird. It’s a plane. It’s Plan Orange. General Bankruptcy Will Murder Crisis. Wants The Job. Smartly injects a massive stimulus – approximately five times the stimulus of the present Obama-administration proposal — in the space of a single month. Starts and completes bankruptcy for perhaps 25 million homeowners in the space of a month. Instantly transforms mortgage investments from bad to good. Instantly strengthens the financial standing of major holders of mortgage assets; the banks and insurance companies who provide loans to all businesses and consumers. Ends the threat of massive derivatives-contract events which would have been triggered by defaulting mortgage investments. “But that lingering risk of (bank) insolvency means that the state needs to be ready to take yet more action. One option is to keep intervening as events unfold. The other (choice) is to shock the markets out of their mistrust by using public money to create a floor to the market, either in housing or in asset-backed securities.” The Economist. March 22, 2008. Wall Street’s Crisis. Should we take such an action, we will unleash a boom from this terrible crisis. We need the boom now to pay off the massive new debts which our government must shoulder. Should we fail to take such an action, we must anticipate a continued deterioration in debt and equity markets. They will fall here, there and everywhere. Only shorts will be smart. We cannot start our recovery until we have completed bankruptcy. Go ahead now and do the denial, anger, bargaining, and depression. Open the window and scream. Then put the fate of the world ahead of the obvious reasons we shouldn’t do this. Yes, we will reward a carnival of bad behavior and make people believe they can get away with it. Should we chose massive global depression instead? And then ask yourself: Is it possible our property market can deteriorate by 40% and no systemic bankruptcy follows? Is the bubble’s very definition homeowners taking on debt they cannot afford — to buy houses priced for a Ponzi flip? Where is that bad debt going to go? Is Bernie Madoff going to take your investment and pay this one off? Somebody should call Bernie on this. It is true that the graph of Plan Orange is crude. The numbers it depicts are wild guesses. Yet crude and limited as the picture may be, and given that the numbers are just a very rough estimate, the picture’s validity may be significant. A mistake of much greater import is to fail to estimate the total overhang of mortgage debts which are now “unsecured” debts. I have not seen a single good estimate of this number. My apologies in advance for those reporters who have tried to determine this number as I am unaware of your work. To the rest of the pool of business reporters I say that your ignorance is best measured by your failure to estimate this crucial number. Reporting on the financial crisis without knowing the volume of “unsecured” mortgage debt is adopting the strategy of blindness to make your way through the most troubling economic event of our lifetime (Edward Pinto, former chief credit risk officer at Fannie Mae, has just estimated negative equity by 12/31/09 as $1 trillion. He also finds no overall negative equity today. I radically disagree with this estimate. (Edward Pinto, January, 16, 2009, How Serious is the Mortgage Problem That Will Confront President Obama). The graph may be crude, but Plan Orange is a true picture of our financial crisis. It is the best starting point to guess what amount of “unsecured” mortgage debt we are going to encounter. And it provides a true, swift, and smart plan for how we may best end the crisis. Plan Orange Volunteers. Promises Ruthless Execution. The unfolding drama has two primary players. They are property values and mortgage debts. As property values fall, the worth of mortgage investments fall. As the value of mortgage investments fall, the solvency of banks falls. Then they wither and die. That is the phase the banks are in now. I can’t imagine any of our major banks can survive our property catastrophe without massive new injections of capital. Plan Orange estimates property values will fall 40% from their peak value by the end of this year. We were down 23% two months ago from the high in summer 2006 (S&P/Case-Shiller Home Price Indices, 20-city Composite, December 30,2008, Home Price Declines Worsen as We Enter the Fourth Quarter of 2008). The plan then wildly assumes 40% of mortgage debts will lose all value because of the fall in home values. Why? For one, you have to start somewhere in this guessing game. And a wild guess of $1 of equity destruction creating about 60 cents of debt destruction has at least the appearance of reason. It mimics our actual nationwide debt-to-equity ratio of 50%. If you measured the value of all mortgages at the market peak they would equal approximately 50% of the value of all residential real estate. One other note to set the fearful into a wild stampeding retreat to the hinterlands: The obvious error in the Plan Orange graph is that equity to begin with is actually much lower than 50% on the properties which are going to default. In any case, stay with the assumption and use the loss of $8 trillion of equity and $5 trillion of mortgage debt as a big picture rule-of-thumb to define our crisis. To those with better information I would deeply appreciate your assistance in better defining these crucial numbers. Before things went bad, the buyer of a home took out a mortgage to buy a home. The logic of that business decision has now become meaningless if the mortgage no longer buys a home. And for many it doesn’t. “First, there must be a credible programme for what Americans call “deleveraging”. The US cannot afford years of painful debt reduction in the private sector – a process that has still barely begun. The alternative is forced writedowns of bad assets in the financial sector and either more fiscal recapitalisation or debt-for-equity swaps. It (deleveraging) also means the mass bankruptcy of insolvent households and forced writedowns of mortgages.” Financial Times. Martin Wolf. January 13, 2009. Why Obama’s plan is still inadequate and incomplete. What happens if five or ten years or 15 years of payments on a mortgage create no wealth for the payer? What if the payments were impossible when the payer believed they would create wealth, but now they create nothing? Does the prospect of no wealth create the desire for impossible effort? It would be safest to say that this family-business decision will not follow the principles of Mother Theresa, unless of course she had a Robin Hood thing. Look at the simple math. It is one thing to pay religiously on a $10,000 credit card to maintain your credit report. It is another question entirely if the bill is $200,000, the house is worth $120,000 (the value of a $200,000 house after a 40% value loss), and the payments last for 30 years. The obvious rational choice is to send the keys to the bank and let them have it. Default. Allow the bank to take ownership. When this happens and the bank finishes foreclosure, the bank sells to a private party for perhaps $80,000. The bank has lost $120,000 ($200,000 mortgage minus $80,000 sale price). This drama has and is and will repeat on a massive scale never seen before in our country. It is not alarmist to say we must expect an Armageddon of foreclosures. Mr. Pinto, the previously referred to former Chief Credit Officer at Fannie Mae, has just estimated this week that one in six mortgages will go into foreclosure in the next four years; a total of nine million mortgages of a total national pool of 57 million mortgages (Edward Pinto, January, 16, 2009, How Serious is the Mortgage Problem That Will Confront President Obama). How would foreclosure filings increase should negative equity approach the $5 trillion mark by year end (as I have estimated). Or what if we hit $5 trillion of negative equity in 2010 or 2011? Versus Mr. Pinto’s estimate of $1 trillion of negative equity resulting in foreclosures of one in six homes? We have never seen before a loss in values comparable to the one we are experiencing today. We are far worse already than the depression — if you count the loss as a percentage of the peak value (Carmen Reinhart & Kenneth Rogoff, Dec. 19,2008, page 5, The Aftermath of Financial Crisis). Their study of 21 bank crises suggest we have three more years of declining property values to get to the end of our property depression. Plan Orange offers a simple solution to this problem. For our $120,000 home with the $200,000 mortgage, Plan Orange says: Have the US Treasury pay down the balance of the mortgage to $96,000 (80% of the present appraised value is $96,000). Click here to see the full plan. If we use this payoff scheme en masse, we would eliminate foreclosures, negative equity, bank failures, derivative default events, and maybe even arrest the fall in property values. Is it possible Plan Orange solves every significant problem in the property and mortgage world, and in a few other worlds as well? Capital Invades the Crisis. Confidence Wins. The plan may be a true solution to an impossible problem, yet it has one decidedly serious drawback: It costs $5 trillion dollars (according to the wild guestimate graph). I was relieved the other day to see World War II cost $17 trillion. That makes Plan Orange affordable. Now I know that cost makes the plan ridiculous. Unfortunately, the loss in property values is also ridiculous. Do we have to do something ridiculous to get out of this ridiculous crisis we are in? It is not ridiculous to believe we must use a ridiculous option to kill a ridiculously massive catastrophe. If we ignore this grave issue, soon we will see pictures of ourselves and they will show our eyes are like dull tiny cue balls. And we will all go by the same name: Zombie. And the world will follow us into oblivion. And stay there. They can’t stop its progress. Only we can. A stimulus package dominates the news of the Obama administration plans. It is irrelevant to the issue of falling property values, disappearing mortgages, and bankrupt banks. It is useless in addressing the major crisis issues. Recent chatter favoring a bad-bank to hold bad loans is a welcome sign that the faction called “economists” are gaining preponderant influence versus the “tea-ceremony” faction. A bad-asset bank, however, has no capacity to arrest property-price destruction or to deleverage zombie consumers in mortgage debt far over their heads. A bad-asset bank only solves one of four major problems in the Vietnam nexus of non-performing assets / bank recapitalization / homeowner default / property-value destruction. Plan Orange attacks all of these problems. Which is better: One or four? The time is right for massive intervention. Plan Orange guides our way forward well. It works in all property bubble countries. A coordinated announcement would create enormous confidence in markets worldwide. Bust can be broken into boom. A bright future is much closer than we have imagined. Courage, ambition, and intelligence are the keys. They are widely available here. Open your eyes to danger and get ready to fight the good fight. A guide to posts on Plan Orange. Plan Orange is now three months old. I have had many helpful comments about its limitations and know many more of the questions which it does not answer. Nevertheless I remain confident that it is more than a good plan: It is the right and the best plan. I also know well the author is far better in economic policy than in personal persuasion. Therefore my request. To any of you who can help, I seek an audience with Congressman Barney Frank. He is very smart. He is a great simplifier, as I am. He is at the center of the storm. Plan Orange promises a massive giveaway to homeowners; many of whom will be the poorest or otherwise the most insecure financially. This should have great appeal to all Democrats. Please send a note if you have any suggestions, or if you have a way in to some other person who may be the right one to see it. I would appreciate any help you can provide in getting Plan Orange into the right hands. My job is not just to think. It is to act too. My phone is (312) 919-8800. 2009 © The New Mortgage Company. All rights reserved.